This report provides a quick update on JDRFs new President and CEO, Aaron Kowalski. Click here to read more. This report focuses on ViaCyte’s islet cell replacement therapies, identified as a Practical Cure in the 2018 State of the Cure for T1D, and features an interview with ViaCyte president and CEO Paul Laikind. Click here to read more. This report examines JDRF's Payroll Expenses, which includes salaries, bonuses, and all other staffing expenses. Click here to read more. This is the seventh annual survey-based report on the giving priorities of T1D donors. The key takeaway is the same as all prior years: the number one reason people make donations to diabetes charities and/or participate in fundraising activities such as walks and galas is to find a cure. Click here to read more. This is a third in a series of reports on JDRF financials. 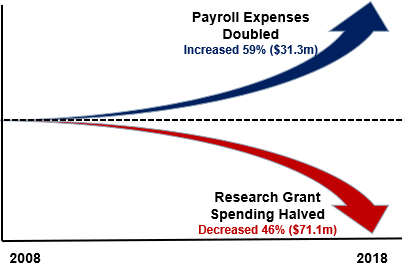 The main takeaway is that JDRF administration cost for each dollar of actual research grants have increased 350 percent since 2008 while research grant spending is down 50 percent. Click here to read more. This report provides an overview of JDRF's 2018 revenue and expenses, released last week. Based on publicly available tax and financial documents, it shows how JDRF generates its revenue and how it utilizes those funds. Click here to read more. This report provides an overview of JDRF's 2018 financial statements, released this week. Based on publicly available tax and financial documents, it show how JDRF generates its revenue and how it utilizes those funds. Click here to read more. This report will review the evolution of encapsulation therapies and examine all companies currently developing encapsulation devices. Encapsulation is a form of cell transplantation, one of the four JDCA Practical Cure Pathways. Click here to read more. This is the seventh annual addition of this report. It summarizes progress made during 2018 toward a Practical Cure for type 1 diabetes. Click here to read more.